A graffiti sign on the Falls Road in Belfast last week. Shaemas O’Sheel probably would have wondered what all of the fuss was about. A fellow like Shaemas -- and, yes, that is how he chose to spell his name -- probably would have been outraged that some people chose not to celebrate the passing of Maggie Thatcher last week. The former British prime minister, of course, will be buried this week with much fanfare, at great expense. 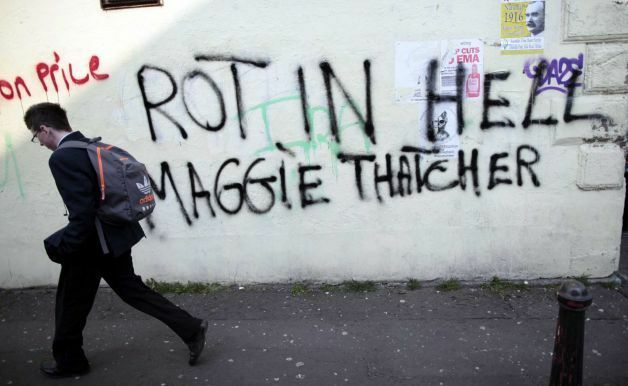 In some circles, the Irish American, um, lack of compassion following Thatcher’s death was a tad heartless. They obviously don’t know their history. And I don’t just mean the bad old days of The Troubles from May 4, 1979 to November 28, 1990, when Thatcher served as prime minister. So much blather is drooled about America’s “special relationship” with the Brits that it is easy to forget the grand history of deeply anti-British sentiment in the U.S. It was not always fashionable or even pretty. But it was robust. And while the Irish were at the forefront, they were joined by many famous and respectable Americans, not to mention a nasty cast of bigots and crackpots. Shaemas O’Sheel sort of falls in between all those categories. It so happens that on the day Thatcher died I was making my way through a fascinating new book entitled Those Angry Days: Roosevelt, Lindbergh and America’s Fight Over World War II, 1939-1941 by Lynne Olson. The book notes that while we like to think of World War II as a conflict which was widely supported by Americans of all races, religions and creeds, in fact, there were bitter divisions about whether or not the U.S. should join the fight. One reason for this strong divide was that World War I was fresh in the minds of many Americans. Thousands of U.S. doughboys perished in the fight once the U.S. entered the war, and many Americans were not clear why. “Once the Great War was over, the belief had taken hold that America had been tricked into it by British propaganda,” Olson writes. You might also recall there was bit of a skirmish at a post office in Dublin in 1916, during World War I. Which brings us to Shaemas O’Sheel. Olson doesn’t mention him in her book, which is odd because you could not have invented a more colorful character. He was a celebrated poet and radical who worked with U.S. senators and Nazi spies. He was actually born James Shields in New York City. By most accounts he had never been to Ireland. Sometime after high school he Gaelicized his name and went about the task of keeping America out of World War I.
O’Sheel, and many like him, were not merely motivated by their desire for Irish freedom in the wake of the 1916 Easter Rising. They believed British treachery was so vast and deep that America was in danger. O’Sheel spelled his vivid theories out in works such as The War of 1920. Published in 1915, O’Sheel envisioned a future in which the British bombed New York City while their allies Mexico and Japan respectively invaded Texas and territories in the Pacific. Only assistance from mighty Germany would save America, according to O’Sheel. Which brings us to the uncomfortable part of this story. As the debate over World War II heated up, many Irish Americans and other anti-British elements in the U.S. flirted with -- or openly embraced -- Hitler and the Nazis. Part of this, of course, was the old “enemy of my enemy is my friend” theory. Others seemed willing to believe in anything that might prevent the shedding of American blood overseas. Either way, O’Sheel once again threw himself into the isolationist fray, bashing Britain while assisting 1940 congressional candidate Joe McWilliams in his bid to win election in the heavily German Upper East Side Manhattan district of Yorkville on a Nazi-sympathizing platform. O’Sheel was also closely allied with fellow Brit-hater and Nazi propagandist James Sylvester Vierick, who was eventually imprisoned for his ties to Germany. So, perhaps the “special relationship” is not so special, after all. And for those who find the Thatcher-bashing distasteful, keep this in mind -- far worse things were said in the good, uh, I mean the bad old days.